AS the ramshackle commuter omnibus slowly made its way into the Harare-Mutare Highway from Cherima high-density suburb in Marondera, Tawanda Choto (19) hangs precariously on to the rear bumper. This has become his routine way of travelling to and from town. “I don’t have transport fare. I depend on my friend who drives this old kombi, hence I hang at the back. The distance is short and I won’t fall. I am careful,” he said with the confidence of someone who has all his wits about him. 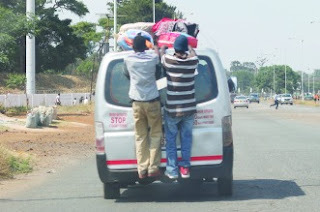 Hanging on to the back of a commuter omnibus or pirate taxi is trending in the country with touts even mastering the art of travelling on top of the vehicles. It’s a dangerous game and a number have been unfortunate to hit their heads on the tarmac with gut-wrenching consequences. In a survey conducted by this paper, the absence of traffic police on the roads along the Chivhu-Mupandawana Highway has resulted in public transport operators allowing touts or “brave travellers” as they are called, to sit on top of their vehicles while others stand on the tow bar, or hanging by the rear mirror. Touts in Marondera and Harare revealed that they are not aware of that they are breaching Section 58 of the Road Traffic Act. “I do not know that it is a crime to move around hanging from a vehicle. I had never heard of anyone who was sent to jail over that. We do this every day,” said a tout who identified himself as Thando at Mupandawana. Speaking at the commissioning of a Traffic Safety Training Centre at Hurungwe Primary School in Murewa recently, Transport minister Joram Gumbo said he was shocked to see touts standing on kombi tow bars and urged police officers to arrest those who violate traffic laws. “I want to appeal to the police not to hesitate to arrest and prosecute those people who hang precariously on kombis. I was shocked to see some of them standing on tow hitches on the highway where kombis can gain speeds of up to 80km per hour or more. “Section 58 of the Road Traffic Act Chapter 13:11 is instructive in this regard. The penalty provision is fine of up to $200 fine and or up to six months imprisonment. Conductors and other culprits you have been warned,” Gumbo said. Arrive Alive Awareness Campaign director, Isaac Tsikai said the police should be out in full force and arrest all those who commit the offence. “It has become a normal thing, to have young people hanging precariously on kombis and pirate taxis. Some have even devised styles of hanging on moving vehicle like sitting on the front bumper. The police need to act and arrest all those committing the offence, lest we will lose lives,” he said. Last year, police warned pirate taxi and kombi drivers and threatened to impound their vehicles if they are found with touts hanging at the back or on the doors of their vehicles. However, it seems the warning fell on deaf ears as the culture is being adopted by others at a faster pace. Traffic Safety Council of Zimbabwe (TSCZ) communications officer Tatenda Chinoda said the trend is just out of ignorance of the law and urged relevant authorities to ensure stiffer penalties to offenders. “Ignorance of the law is no defence. Besides the law, no one in their right mind can regard riding on bus or kombi tops or hanging precariously from the rear bumper of a moving vehicle as safe. The police must be back on our roads in full force. Offenders must be met with stiffer penalties. Road traffic safety is a must. It must be demanded of others for the safety of everyone,” he said. To Choto, going back home standing on the tow bar is all he can afford. He blames the bad economy for his actions. Perhaps, he will become enlightened on the seriousness of the offence when someone is arrested and jailed. For now, he finds comfort in the growing number young people who are doing it and getting away with it.